The AHD is designed for a quick and easy installation on non-rated vertical and horizontal surfaces made of drywall or any other type of material. Its rounded mitered corners, concealed pin hinge and 3/8" return all around the door make it the sturdiest door on the market. The AHD prevents sagging as compared to flat door panels and requires fewer locks. 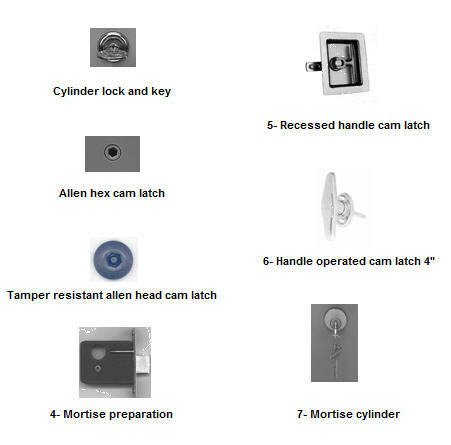 Key operated cylinder cam latch, head hex cam latch, pinned hex head cam latch, handle operated cam latch, mortise preparation for cylinder.